Whilst the Planet of the Apes franchise has seen a successful reinvention with 2011’s Rise of the Planet of the Apes and last summer’s smash hit sequel Dawn of the Planet of the Apes, it’s likely that a sizeable section of the audience are unaware that there is indeed a franchise that began life decades earlier. Based on the novel by French author Pierre Boulle (whose works also include The Bridge over the River Kwai), Planet of the Apes is the science fiction film classic that would spawn an enduring and popular franchise which by the mid 1970’s would include four sequels and two television spin-offs (one live action, one animated) as well as a plethora of merchandise. Adhering relatively close to the main plot elements of Boulle’s novel, the film adaptation of Planet of the Apes diverges creatively to depict a more primitive ape society as opposed to the technologically advanced one described in the novel (and the initial script by Twilight Zone creator Rod Serling, which was subsequently rewritten by Michael Wilson) – primarily due to budgetary concerns and the practical limitations of the times. This is however all in the film’s favour, giving it a more ‘primal’ feel aided by some basic yet wonderful production design. Charlton Heston brings star power to Planet of the Apes and is a reliably strong lead as the cynical and misanthropic Taylor who finds himself the subject of controversy and scrutiny as an intelligent and articulate primate, captured and caged like an animal in a world where humans are the mute and lower species. The real draw however are the ape characters – wise and humble chimpanzees Cornelius (McDowall) and Zira (Hunter) who fall foul of the hateful and cantankerous orangutan Dr. Zaius (Evans) as they befriend Taylor. Of the ape actors, Roddy McDowall is the standout performer and would continue to delight and further explore the character of an advanced simian in sequels Escape from the Planet of the Apes, Conquest of the Planet of the Apes and Battle for the Planet of the Apes (he was unavailable for first sequel Beneath the Planet of the Apes) as well as the short-lived live action television series. Naturally, this brings us to one of the biggest highlights of the entire production – the incredible makeup and prosthetic design of the apes themselves. Created by John Chambers (responsible for Mr. Spock’s iconic pointed ears in Star Trek) and complemented by Morton Haack’s costume design, the ground-breaking makeup effects still hold up today and would rightfully earn him an honorary Academy Award. Whilst there are elements of satire and thought provoking exploration of themes such as society, racial prejudice and cautionary tales of the human condition reminiscent of all good science fiction, a large part of the appeal of Planet of the Apes is its pure entertainment value and the depiction of a believable ape society with its hierarchy split across three central ape creeds – the political orangutans, the scientific and academic chimpanzees and the militant gorillas. Another key component of Planet of the Apes is the inventive and experimental Academy Award nominated music score by Jerry Goldsmith for which he employed the use of unusual instruments and unconventional techniques to help create the eerie and primal feeling of the ape’s world. Planet of the Apes leaves the viewer with one of film’s greatest and most iconic twist endings, (retained from Rod Serling’s original script) – the revelations of which I shall not divulge here for those who have not seen this classic slice of SF cinema. Finding themselves in a field where a mute and dumb human society is ‘grazing’, astronauts Taylor, Landon and Dodge are shocked to witness the arrival of clothed, rifle wielding gorillas…on horseback! It depicts a believable society of intelligent apes, thanks to a successful blend of production design, incredible makeup effects and the delightfully nuanced performances of actors such as Roddy McDowall. It features a wonderfully eerie and inventive score by Jerry Goldsmith. It delivers a shocking and memorable finale which stands as one of the most iconic moments in film history. Screenwriter Michael Wilson was blacklisted by Hollywood for being a communist during the era of the McCarthy ‘witch hunt’ trials. Planet of the Apes (2001) : flawed though it may be, Tim Burton’s reimagining is still worth a look and evokes the spirit of the 1968 original by featuring superb makeup design and a mind boggling twist finale that still provokes discussion today. Rise of the Planet of the Apes : the Apes saga begins anew with this smart reinvention that replaces practical ape makeup effects with remarkable motion capture performances melded with breath-taking CGI. Taylor (Charlton Heston) befriends chimpanzees Zira (Kim Hunter) and Cornelius (Roddy McDowall) in the classic original ‘Planet of the Apes’. Coming 30 years after the release of Mad Max: Beyond Thunderdome and surmounting the pitfalls of a troubled and protracted production, Mad Max: Fury Road marks the return of director/writer George Miller’s cult anti-hero, the ‘road warrior’ Max Rockatansky. The title of this newest chapter in the Mad Max ‘odyssey’ is both apt and telling for Fury Road is as mad as it is furious…and all the more fun and exhilarating for it. Tom Hardy is a suitably gruff and slightly more psychotic Max, an extension of Mel Gibson’s original portrayal that doesn’t stray sharply from what has come before yet allows Hardy to make the role his own. Despite this being a Mad Max film it’s actually surprising that Max himself largely relinquishes the stage to the Imperator Furiosa, right-hand women of central villain Immortan Joe (original Mad Max actor Hugh Keays-Byrne) whose subsequent betrayal initiates the film’s narrative as Furiosa escapes with the Immortan’s wives (amongst them Transformers: Dark of the Moon’s Rosey Huntington-Whitely and X-Men: First Class’s Zoe Kravitz) in search of salvation and redemption in the green promised land of her origins. Theron gives her all to present a tough as nails and reasonably defined action heroine, kudos to both the creativity of Theron and Miller (also serving as co-screenwriter). Keays-Byrne is appropriately deranged as Immortan Joe, spouting manic sermons as he leads his band of rabid albino followers across the barren wastelands in relentless pursuit of Furiosa. Amongst those minions is Nicholas Hoult (X-Men: First Class and X-Men: Days of Future Past) as the devoted Nux, another of the film’s eccentric characters that is granted an appreciable amount of screen time. He’s a joy to watch and is as much a part of the piece as Max and Furiosa. Much like the desert landscapes Fury Road depicts, dialogue is sparse and storytelling kept lean and simplistic. It’s not wholly important in the grand scheme of things for this is an outrageous and pounding attack on the viewer’s senses as Miller runs riot with a not-so-modest production budget (rumoured at around $150,000,000) to deliver some of the most elaborate and exhilarating vehicular action sequences ever realised – the smashing and grinding of metal complemented by the surging electronic symphonies of Tom Holkenborg’s (aka Junkie XL) music. It’s all the more impressive considering that the action was largely achieved practically with only the merest hints of CGI enhancement. Needless to say then for Mad Max: Fury Road, the dial has been turned up to eleven as the wall to wall action refuses to allow the audience to catch their breath. There is however the odd patch of calm to allow an appreciation of the subtleties of character and the desert vistas, presented by some beautifully striking cinematography. Ultimately Fury Road doesn’t quite match up to the greatness of Mad Max 2 but director George Miller delivers a solid continuation of the Mad Max series that retains the niche quality of those original Mel Gibson outings whilst expanding the appeal to modern blockbuster audiences with its non-stop action and raw energy. The bottom line: Mad Max: Fury Road is a brutal mash-up of deranged madness, delightfully eccentric characters and adrenalin infused action that will exhaust the senses and boggle the mind. Mad Max: Fury Road is in cinemas now. 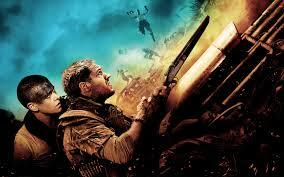 George Miller’s iconic road warrior returns in the relentless and exhilirating ‘Mad Max: Fury Road’.